Zip Lines, Bridges, and other Accessories. All other topics related to building things in trees generally come up either in class sessions or in questions. Formal instructional sessions. These are interactive sessions where we have certain subject materials to cover, but questions are encouraged and we want to make tree house building theories as practical as possible. These sessions will be led by staff and guests from Tree Top Builders, Inc. and Treehouse Supplies companies. Hands-on tree house building experience. Each tree house building workshop will feature construction or partial construction of at least one tree house, tree house platform, or other tree attached feature. Please see the specific tree house workshop description for more details. We will teach proper installation for treehouse attachment bolts (TABs) and other tree house fasteners. As time and schedule allows, we can cover other accessories and features such as ziplines, swings, and bridges. 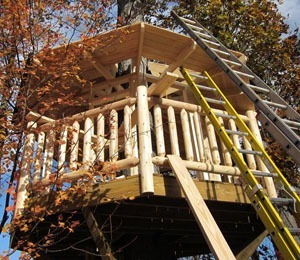 Informal time where we can “talk treehouses.” We are available to review your plans for your tree house or help you get started making them, so if you want specific advice, then please bring pictures and measurements of your tree(s) and sketches of the treehouse if you have drawn them already. Good food and Good times! We serve meals in and around the class time so that people can stick around and enjoy fellowship with other tree house builders and learners. Contact us to ask questions or to reserve a spot!